Perry has a lair under the Flynn-Fletcher's house that can be entered through various passages. One example is the Chimney-Vator, in which he encounters Santa. Other entrances include one in the side of the tree, another in the side of the house, one in the middle of the backyard, and various others scattered throughout the property and even other parts of the city. His nemesis is Dr. Heinz Doofenshmirtz. Perry's mission is almost always foiling the doctor's plans, which he successfully accomplishes almost every time even with minimal details about the plans. Typically, during these missions, his battle with Dr. Doofenshmirtz unintentionally cleans up whatever Phineas and Ferb have been working on that day. For one mission (and only one mission) his nemesis was The Regurgitator, whose current nemesis is the world. When not within his persona of espionage, Perry takes on the appearance of a "mindless domestic pet"
"Well, he is a platypus. They don't do much." 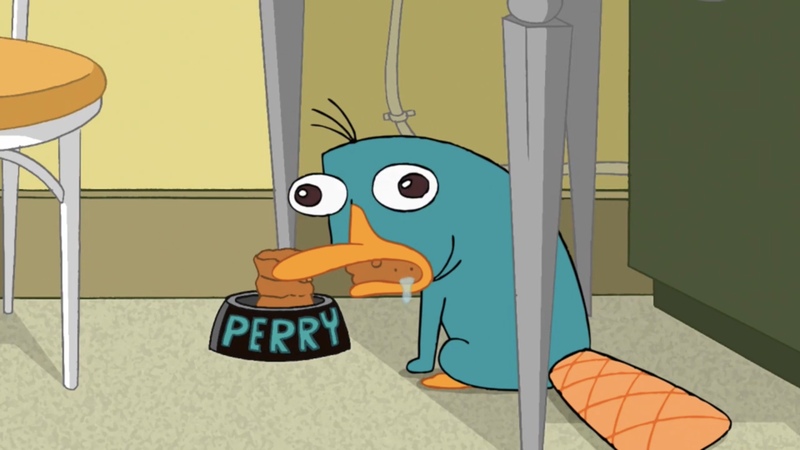 Perry is the Flynn-Fletcher family 's only pet that has been mentioned in more than one episode, or rather, every one (others in only a single episode include the deceased Bucky, the freedGoldie, the captured Mr. Cutie Patootie, or Steve who blends into the surroundings). In order to prevent his family and other people from learning his identity, Perry takes steps to reinforce the perception that he is "just a mindless animal that doesn't do much". His primary method to achieve this status is to direct each of his eyes outwards in opposite directions, creating the "dumb" look. Once he is certain that he is no longer being watched, Perry drops the act and retrieves his secret agent hat, a fedora. During his mission as "Perry the Teenage Girl", Perry continued to use this method to mask his true intelligence. Perry has become adept in switching between his two disguises and can perform the switch in rapid succession ("Traffic Cam Caper", "The Chronicles of Meap", "No More Bunny Business", "Picture This", "Swiss Family Phineas"). Perry's most successful disguise might be that of when he and Candace accidentally switch bodies. ("Does This Duckbill Make Me Look Fat?") When Perry (in Candace's body) first enters his lair to receive his mission briefing,Major Monogram thinks that there has been a breach of security. Once the hat falls on Perry's head, Major Monogram identifies him as "Agent P" and praises Perry for the "brilliant disguise", while Carl is disappointed to learn that it is not a real girl. Likewise, when Perry breaks in to Doofenshmirtz's building, the doctor exclaims "A teenage girl?". After Perry puts on the fedora, Dr. Doofenshmirtz shrieks, "Perry the Teenage Girl?". While all the Agents wear similar hats, it is this particular hat that allows people to identify Perry as Agent P, as shown in "No More Bunny Business" when Dennis wears Perry's hat and a scanner is shown, scanning an apparent bar-code like structure to hack into the O.W.C.A . as Perry. Agent P has used the "Groucho glasses" to narrowly avoid being recognized by Linda Flynn in the street ("Flop Starz"), disguised himself as Dr. Lloyd Wexler ("A Hard Day's Knight"), and disguised himself as Ferb and Norm("Traffic Cam Caper"). Inside the Superduper Mega Superstore, when Perry wears a Hawaiian shirt, sunglasses and a bowler hat, none of his acquaintances at the mall are able to recognize him ("Vanessassary Roughness"). Major Monogram makes him come into his lair as a magpie for a joke. Carl and Major Monogram laugh and then ask him to do it as a bunny rabbit but Perry seems very annoyed ("Boyfriend From 27,000 B.C."). It is currently unknown how Perry was recruited into the Agency in the first place, nor what kind of training Perry has undergone before receiving missions. Wrist communicator. Perry wears a watch-like communicator on his front left paw, and one on his front right paw, although it could be the same watch. It is normally hidden by his fur. ("Traffic Cam Caper", "Oh, There You Are, Perry", "Swiss Family Phineas", "No More Bunny Business", "Fireside Girl Jamboree" ). Notepad and pencil. Perry uses it to write down notes for his missions but where he has it while not using it is unknown. Perry has also been seen drawing Major Monogram on the notepad while being briefed for a mission. Fedora. Agent P's fedora serves several purposes. First of all, the hat identifies him as a secret agent. In "No More Bunny Business" it appears to have a hidden bar-code that allows him to access the computer. There is a spring inside the hat that, when pulled, starts a motor which causes the brim of the hat to spin. The hat can then be used as a circular saw. ("Gaming the System") On at least one occasion, Agent P is able to pull an object out of his hat, which he uses to fight Dr. Doofenshmirtz or help himself escape: a can of Fancy Cheese Spray ("I, Brobot") or a hot dog ("Backyard Aquarium"). The hat may also be used like a boomerang. 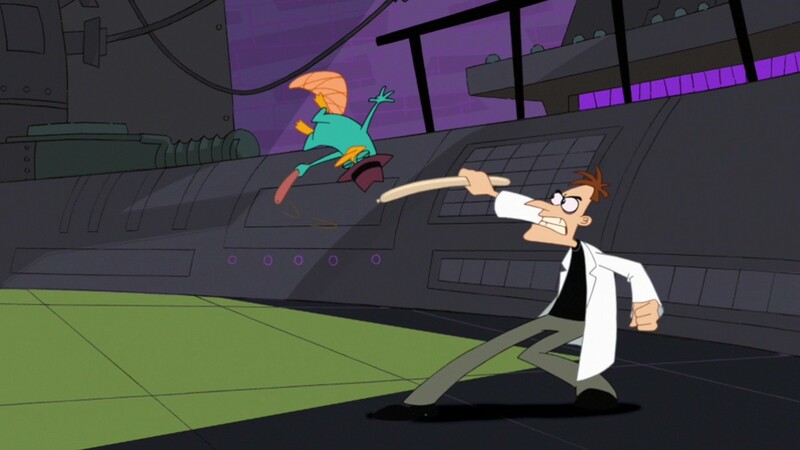 In ("Voyage to the Bottom of Buford") Perry uses his hat in this way to knock Dr. Doofenshmirtz's controller to the ground, damaging it and setting him free. In addition, it seems to have unnatural abilities to stay attached to its owner's head; it stays put on Agent P's head underwater and even in space ("Out to Launch"). He seems very attached to it; in circumstances when it is in danger of being blown away, he holds it with one paw on it to keep it in place, and in ("No More Bunny Business"), Agent P is furious when Dennis the rogue agent steals his hat and uses it to access the Agency's mainframe. Once Dennis is defeated, Agent P snatches his hat back from him indignantly and returns it to its proper place on his own head. Parachute. Agent P, while many times escaping by jumping off something high like a bulding or a plane, is able to use a parachute with a picture of his face on it. It is unclear where he keeps it. Para-glider. Agent P possesses an orange para-glider with his face on it. He uses it to access places as well as escape from them. Like his parachute, it is still unclear where he keeps it when it's not in use. He also seems to have excellent skill in controlling it. In Transport-inators of Doooom!, when Agent P is not using it it looks like a jet pack. When in use in looks like his tie; the game has made some modifications. Hoverjet. Agent P's hover jet is platypus-shaped, and is hijacked and mistaken by Phineas to be one of Ferb's inventions in the episode "Ready for the Bettys". In "Phineas and Ferb Summer Belongs to You!" Doofenshmirtz chases Vanessa in it with Perry and Major Monogram. Scooter. Agent P has a white scooter with a green stripe down the middle. ("Flop Starz", "Does This Duckbill Make Me Look Fat?" ). To maintain his cover, Perry adopts the disguise of a "mindless animal" around people. During one of his missions ("Journey to the Center of Candace"), when Perry realizes Doofenshmirtz's plans will directly affect Phineas and Ferb, Perry takes decisive action to stop him immediately instead of following the spy routine (being trapped and then escaping) as usual. Perry's reaction indicates that he cares for the well-being and safety of the boys. The reason for this action may be that the boys provide Perry with more than just a cover, but also with affection. On another occasion ("Ready for the Bettys"), he follows the boys to guard them when they go on their own "mission" (however, he may have done so strictly on Major Monogram's orders). Perry has even allowed Phineas and Ferb to dress him in an extremely humiliating costume for their circus show and averts his mission temporarily to appear in his act ("Jerk De Soleil"). Perry's affection for his family is most obvious and very indicative when he had a nightmare that his 'animal side' cover was blown and he is forced to lose the Flynn-Fletcher family and get a replacement ("Phineas and Ferb Get Busted"). 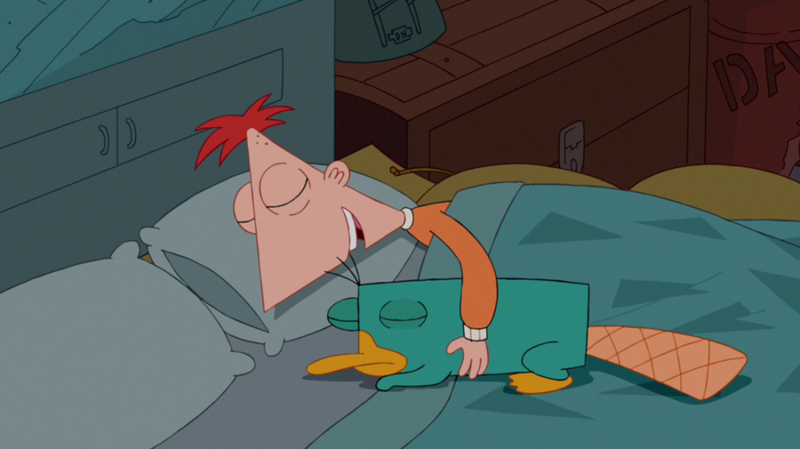 When Perry wakes up from the nightmare, Phineas reassures him that it was just "a bad dream", causing Perry to smile and go back to sleep. Perry's feelings for his owners are further showcased when he is faced with the prospects of moving to a new family in order to combat another evil scientist: he appears visibly shaken and sad ("Oh, There You Are, Perry"). In the song "Come Home Perry", Phineas mentions that Perry is the color of a blueberry and is "kinda short and hairy." 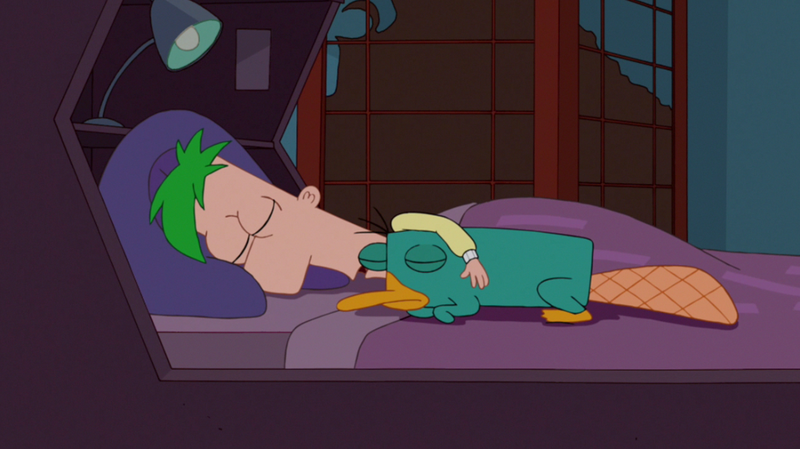 Also in "Oh, There You Are, Perry", it is shown that Perry spends part of the night sleeping in Phineas's bed and at some point switches over to Ferb's so as to not show preference or play favorites with any one of them. Also, he sometimes appears in the mornings on Candace's bed, even though it annoys her to no end. This may be because he's trying to give Candace a turn as well. 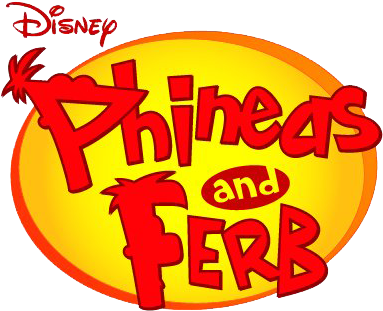 Phineas and Ferb have several projects featuring their pet platypus: an "inaction figure", a restaurant, a circus show, an animal language translator and a machine to nurture what is thought to be Perry's egg. While Perry does not exhibit any different behavior around Candace than he does around other people, he does tend to show up beside her in unexpected and sometimes unwanted places. He seems to especially like her bed. Candace is easily annoyed by Perry's odor, or perhaps his sheer presence, as she repeatedly berates her brothers for letting Perry wander into her room ("Does This Duckbill Make Me Look Fat?"). Perry has interrupted Candace's dream at least once by making his characteristic chirping noise on her bed ("Candace Loses Her Head"). However, there are instances when Candace appears to be more friendly to Perry ("Traffic Cam Caper", "Mom's Birthday"). Candace is overwhelmed by feelings of guilt when Perry goes missing, as she has angrily put Perry outside the house after tripping on him the night before ("Oh, There You Are, Perry"). One rare instance of Perry's reaction towards Candace occurs in "Oh, There You Are, Perry", when Perry mockingly imitates Candace behind her back. Nevertheless, Perry saves a hallucinating Candace from being blown up in Doofenshmirtz's new secret base. ("The Ballad of Badbeard") Perry saves Candace from Doofenshmirtz's Evil Witch Castle in her dream ("Wizard of Odd"). On some occasions Candace sees Perry as Agent P, but later thinks that she is just seeing things and ignores it. The Druelselsteinien mad scientist Heinz Doofenshmirtz first met his nemesis, Perry, on the day he had his portrait taken. Perry had been spying on the mad scientist from across the street ("It's About Time!"). Agent P's job is to stop whatever evil scheme of Dr. Doofenshmirtz. Agent P always finishes his job nicely, leaving the doctor screaming "Curse you, Perry the Platypus!". It is unclear how Dr. Doofenshmirtz knows his platypus nemesis's pet name, "Perry". 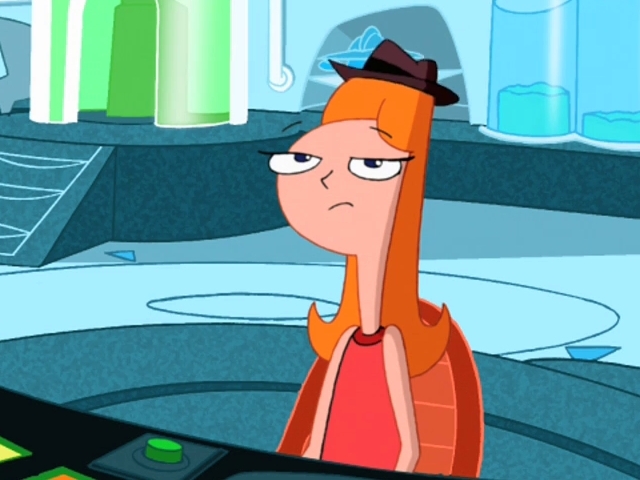 The doctor usually calls Perry "Perry the Platypus", not "Perry" and never "Agent P". The only times he has called Agent P "Perry" are in "At the Car Wash" ("Oh, sorry, Perry, I didn't mean to get all street there! "), "Hide and Seek" ("Oh, it will be so delicious to know where Perry lives! "), and "The Bully Code" ("Oh, Perry the Platypus, have you come to sign my cast? Look, I saved you a spot right there, it says "Save for Perry"). Over time, they have become each other's frenemy. In some cases, after confronting Dr. Doofenshmirtz and evaluating the situation, Perry decides to help Dr. Doofenshmirtz with his not-so-evil plans. Notable examples include setting up a birthday party for the doctor's daughter ("Dude, We're Getting the Band Back Together") and pretending to be the doctor's pet ("Get That Bigfoot Outa My Face!"). Perry has agreed to help Doofenshmirtz go shopping ("Unfair Science Fair Redux (Another Story)"), wait patiently until the doctor finishes his creation ("I Scream, You Scream") and let the doctor control the giant dragon robot while Perry himself controls the Queen Elizabeth robot which the doctor deems not evil enough for him ("A Hard Day's Knight"). At one point, the doctor gave Perry a key to his apartment because he felt it was "more civilized than crashing through his ceiling" ("I, Brobot"). 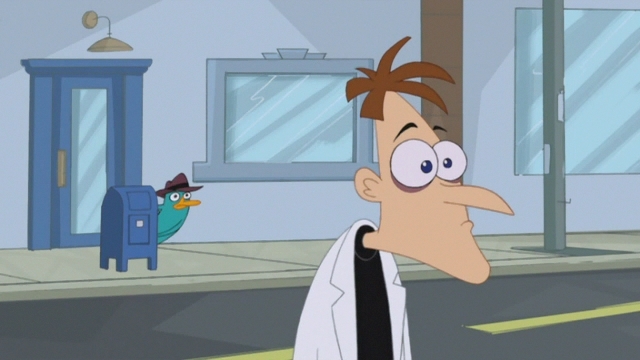 Dr.Doofenshmirtz even shared some of his chicken wings with Perry ("The Lake Nose Monster"). Also, Perry seemed to feel guilty and paid for a door he broke while busting in to Doofenshmirtz's lair ("Lights, Candace, Action! ").